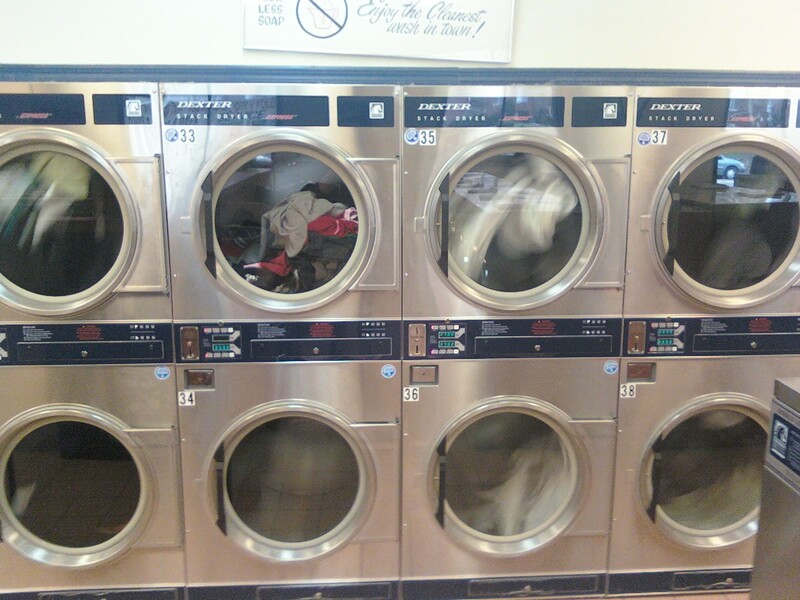 Or, How I Learned to Stop Worrying and Love the Laundromat. 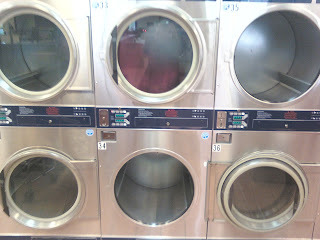 It's also my five-week laundriversary...... Blaiser opines that everyone in the Free, Newly-Insured World ought to do laundry every five weeks, whether they need it or not. And for heaven's sake, be Liberal. At this typing, I have no fewer than 7 dryers spinning 3 washer loads'-worth of some 50 pounds of things-that-touched-my-body. Let me tell you, despite all that calculus, it's a powerful feeling. It's hell on the writing, though. 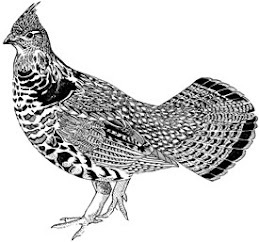 At 8 minutes a quarter, and staggered starts, checking and re-ponying quarters has emerged as this week's chief aerobic exercise. At the laundromat, we have each other's backs. 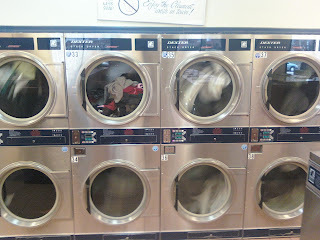 I help another 30's-40's guy by holding the in-swinging door, when his arms are full; the wise old laundry ladies patiently remind me to check my washers for last-minute socks plastered against the drum. Two-and-a-half hours later, I'm down to three holdout towels in one dryer, the last resistance to my war against dampness. I've enjoyed my morning here. As laundromats go, it't really not a bad place to celebrate one's blogiversary. Spring's here. The clothes are clean. All.of.them. Thy father's station wagon is thy trusty transport. And.... the last quarter has run out. Thus, I embark on The Next Year of trying to work out Zany Optimism CTM. Harsh remarks, constructive criticism and bubbly encouragement gratefully accepted below. Thanks for reading. And for the love of Mike, please don't forget that no matter how long it is until Baseball's Opening Day, Senator Lowell will always reach across the aisle of the Nation. Keep writing because your audience awaits! Thanks for the encouragement, Cher! Happy Spring. So are you also separating whites and darks? And using different wash and dry temperatures? Happy First Blogiversary! Did you ever see the "Northern Exposure" episode about washers and dryers? 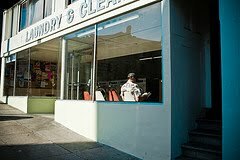 Episode 5.8 - Heal Thyself - "Fed up with the dilapidated machines at the laundromat, Maggie decides to splurge on a brand new washer and dryer for her house. Unfortunately, she misses the quality gossip time she spent with everyone over dirty laundry. When a minor belt breaks in the machine, Maggie gleefully sends it back to the manufacturer and rejoins the weekly gathering." Totally one of my favorite shows. I have the CD with the soundtrack and a bunch of cool tunes they used. Everything from Frederica Von Stade to Booker T. and the MG's.